Mongoose is an Object Data Modeling (ODM) library for MongoDB and Node.js. It manages relationships between data, provides schema validation, and is used to translate between objects in code and the representation of those objects in MongoDB. MongoDB is a schema-less NoSQL document database. It means you can store JSON documents in it, and the structure of these documents can vary as it is not enforced like SQL databases. This is one of the advantages of using NoSQL as it speeds up application development and reduces the complexity of deployments. ‘Collections’ in Mongo are equivalent to tables in relational databases. They can hold multiple JSON documents. ‘Documents’ are equivalent to records or rows of data in SQL. While a SQL row can reference data in other tables, Mongo documents usually combine that in a document. ‘Fields’ or attributes are similar to columns in a SQL table. 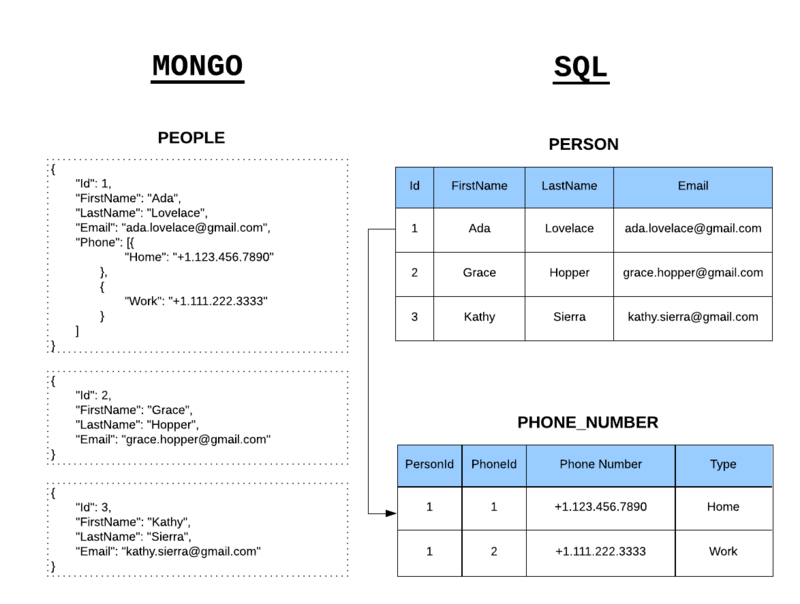 While Mongo is schema-less, SQL defines a schema via the table definition. A Mongoose ‘schema’ is a document data structure (or shape of the document) that is enforced via the application layer. ‘Models’ are higher-order constructors that take a schema and create an instance of a document equivalent to records in a relational database. Let’s navigate through some of the basics of Mongoose by implementing a model that represents data for a simplified address book. I am using Visual Studio Code, Node 8.9, and NPM 5.6. Fire up your favorite IDE, create a blank project, and let’s get started! We will be using the limited ES6 syntax in Node, so we won’t be configuring Babel. The above install command will install the latest version of the libraries. The Mongoose syntax in this article is specific to Mongoose v5 and beyond. Create a file ./src/database.js under the project root. Next, we will add a simple class with a method that connects to the database. Your connection string will vary based on your installation. The require(‘mongoose’) call above returns a Singleton object. It means that the first time you call require(‘mongoose’), it is creating an instance of the Mongoose class and returning it. On subsequent calls, it will return the same instance that was created and returned to you the first time because of how module import/export works in ES6. Similarly, we have turned our Database class into a singleton by returning an instance of the class in the module.exports statement because we only need a single connection to the database. ES6 makes it very easy for us to create a singleton (single instance) pattern because of how the module loader works by caching the response of a previously imported file. A Mongoose model is a wrapper on the Mongoose schema. A Mongoose schema defines the structure of the document, default values, validators, etc., whereas a Mongoose model provides an interface to the database for creating, querying, updating, deleting records, etc. This reference will be the same as the one that was returned when we connected to the database, which means the schema and model definitions will not need to explicitly connect to the database. A schema defines document properties through an object where the key name corresponds to the property name in the collection. Here we define a property called email with a schema type String which maps to an internal validator that will be triggered when the model is saved to the database. It will fail if the data type of the value is not a string type. Mixed and ObjectId are defined under require(‘mongoose’).Schema.Types. We need to call the model constructor on the Mongoose instance and pass it the name of the collection and a reference to the schema definition. A schema definition should be simple, but its complexity is usually based on application requirements. Schemas can be reused and they can contain several child-schemas too. In the example above, the value of the email property is a simple value type. However, it can also be an object type with additional properties on it. Let’s enhance the Email schema to make the email property a unique, required field and convert the value to lowercase before saving it. We can also add a validation function that will ensure that the value is a valid email address. We will reference and use the validator library installed earlier. Mongoose has a flexible API and provides many ways to accomplish a task. We will not focus on the variations because that is out of scope for this article, but remember that most of the operations can be done in more than one way either syntactically or via the application architecture. The _id field is auto-generated by Mongo and is a primary key of the collection. Its value is a unique identifier for the document. The value of the email field is returned. Notice that it is lower-cased because we specified the lowercase:true attribute in the schema. __v is the versionKey property set on each document when first created by Mongoose. Its value contains the internal revision of the document. If you try to repeat the save operation above, you will get an error because we have specified that the email field should be unique. Let’s try to retrieve the record we saved to the database earlier. The model class exposes several static and instance methods to perform operations on the database. We will now try to find the record that we created previously using the find method and pass the email as the search term. We have looked at some of the basic functionality above known as CRUD (Create, Read, Update, Delete) operations, but Mongoose also provides the ability to configure several types of helper methods and properties. These can be used to further simplify working with data. A virtual property is not persisted to the database. We can add it to our schema as a helper to get and set values. Callbacks for get and set must use the function keyword as we need to access the model via the this keyword. Using fat arrow functions will change what this refers to. We can create custom helper methods on the schema and access them via the model instance. These methods will have access to the model object and they can be used quite creatively. For instance, we could create a method to find all the people who have the same first name as the current instance. Adding instance and static methods is a nice approach to implement an interface to database interactions on collections and records. When model.save() is called, there is a pre(‘save’, …) and post(‘save’, …) event that is triggered. For the second parameter, you can pass a function that is called when the event is triggered. These functions take a parameter to the next function in the middleware chain. Suppose that we want to track when a record was created and last updated on every collection in our database. Instead of repeating the above process, we can create a plugin and apply it to every schema. Mongoose has a very rich API that handles many complex operations supported by MongoDB. Consider a query where we can incrementally build query components. We have barely scratched the surface exploring some of the capabilities of Mongoose. It is a rich library full of useful and and powerful features that make it a joy to work with data models in the application layer. While you can interact with Mongo directly using Mongo Driver, Mongoose will simplify that interaction by allowing you to model relationships between data and validate them easily. Fun Fact: Mongoose is created by Valeri Karpov who is an incredibly talented engineer! He coined the term The MEAN Stack. If this article was helpful, ❤️ it and follow me on Twitter.